Before starting, please read through the instructions and see the hand and fingerprint examples below. You may want to watch the short video “How to Take a Hand Print” here. If you have any cuts or open wounds on either of your hands, please wait until they are healed before printing your hands. Disposable pre-inked sheets are available from the AAHA office for client readings (email packard.kay@gmail.com) or purchase from www.HITTMarking.com. 1. Remove jewelry. Wash hands and let dry. 2. Lay out materials on countertop near a sink with running warm water. 3. Carefully pull apart the pre-inked sheets by pulling the top sheet away from the bottom sheet at one of the corners. 4. Turn over the top sheet of pre-inked paper so that both inked sides are facing up, next to each other on the counter. 5. Lay your right hand on one of the pre-inked sheets. Firmly press on the back of your hand so that your palm and fingers are pressed into the ink. With the sheet of inked paper stuck to your hand, lift your hand and press the inked paper into the center of your palm and fingers. Move the inked sheet around your hand so that the ink is distributed evenly over your hand. Your entire palm, fingers, and fingertips should all be well coated with ink. Pull the inked paper off of your hand and be sure your entire hand is covered in ink. Reapply the same ink sheet if needed to any area of your hand that is missing ink. Set the inked paper aside. 6. With your inked hand and fingers in a comfortable and natural position, press your hand onto a sheet of plain paper. Lay your hand onto the paper beginning with the base of the palm, firmly pressing down as you progress to the top of the palm and the fingers, ending with the upper sections of the fingers. Lift your hand, with the paper attached, and gently press up underneath the paper so that it presses into the center of your palm. 7. Pull the paper off your hand and set your handprint aside. Make sure you have a print of the entire hand, including the center of the palm and the fingers, as much as possible. If not, you can use the same pre-inked sheet to reapply more ink and take a second print. Sometimes the center of the palm does not print, but that’s okay; do the best you can do. 8. Print each fingertip on the bottom of the sheet with your handprint (see example below). Start with the thumb. Place the thumb on the inked sheet of paper so as to cover the entire upper section of the thumb. Then press the inked thumb onto the handprint sheet, at the lower left side of the page. Repeat for each finger in order. 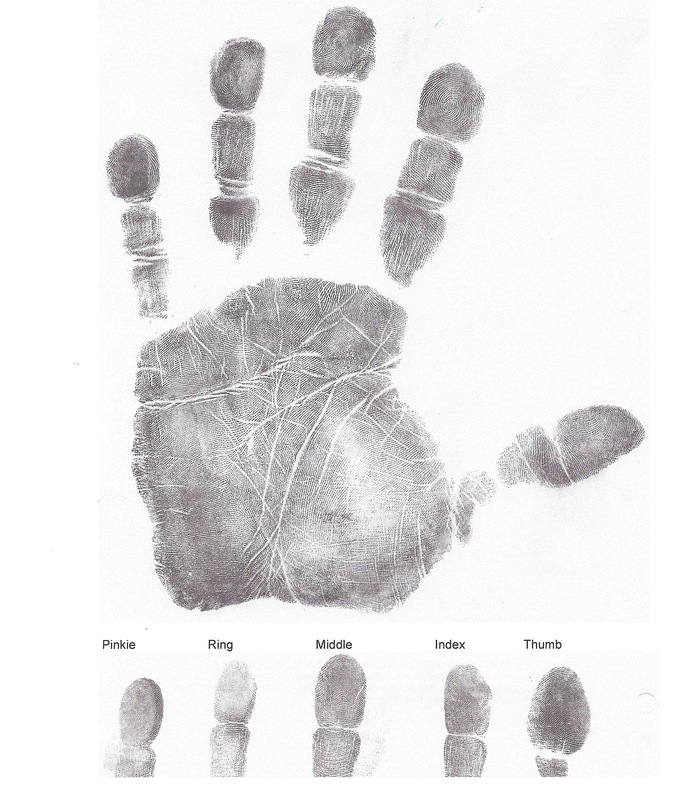 Label each of your fingerprints as noted in the example print below. 9. Wash your hand with soap, warm water, and a scrubbing pad (if needed). 10. With your left hand, repeat steps 5 through 9, using the other half of the same pair of pre-inked sheets and another piece of plain paper. 11. Write your name and the date all handprint sheets. Let your handprints dry before stacking them together.